Willoughby Lake is the deepest lake in the area, making for lots of different stories, some true and some maybe not. Either way it is surrounded with mysteries. Picturesque Willoughby Gap supports two mountains (Mt. Pisgah and Mt. Hor) for hiking or ice climbing and each offers spectacular views from the top. Scuba divers love to explore the depths of Willoughby Lake, swimmers enjoy the cleanliness, boaters enjoy the expanse and fishermen enjoy the record size fish. There are three beaches for entertainment; one nice sandy beach is located at the north end of the lake which is the largest and most popular and the other two are at the south end. One is a family beach across the road from White Caps Campground (http://www.whitecapscampground.com/) and the other, for those so inclined, is a nudist beach. For rentals and restaurant try the Willoughvale Inn and Cottages (www.willoughvale.com). Gorgeous, very private, attention to detail and 120' of frontage on Lake Willoughby, which many people consider Vermont's most beautiful and pristine lake. You have direct views from your house an decks of the Willoughby Gap. Soaring cathedral ceiling in living room along with fireplace, hardwood floors and atrium doors leading out to deck that overlooks the lake. The rest of main floor ceilings are 9' high and wood with exposed beams. Granite counters, stainless steel appliances and ceramic tile flooring accent the kitchen. Formal dining room & laundry/half-bath combo round out main level. Second level offers 2 spacious bedrooms with vaulted wood ceilings. A full bath with Jacuzzi tub, glass shower, granite counters and ceramic tile floor. Your finished basement includes 3rd bedroom, 2nd kitchen, 3/4-bath, and family room with doors leading to your lower deck overlooking the lake. Detached 2-car garage offers finished studio/office space above. Exterior features of home include 4 decks and a screened porch. Nicely landscaped. And you can enjoy your evening bonfires with family and friends setting around your fire pit on the lake. All docks are included. This is a must see property. Price has been reduced. Very private and well maintained property that is perfect for a family compound or excellent rental potential. Consisting of (3) three cottages on 1.22 acres and direct frontage on Lake Willoughby. The main cottage, (Westlook) offers 4 bedrooms, 2 full baths, large kitchen/dining area, living room with fireplace, wraparound covered porch overlooking the lake and garage and workshop. The second cottage (Ledges) offers 3 bedrooms, full bath, formal dining room, large kitchen and living room. Third cottage (Snuggery) offers 1 bedroom, living room,3/4 bath, cathedral ceilings and large deck. Main cottage has never been rented, the other two have good rental history. The grounds are absolutely gorgeous. Property also offers a very nice recently renovated boathouse and private dock. 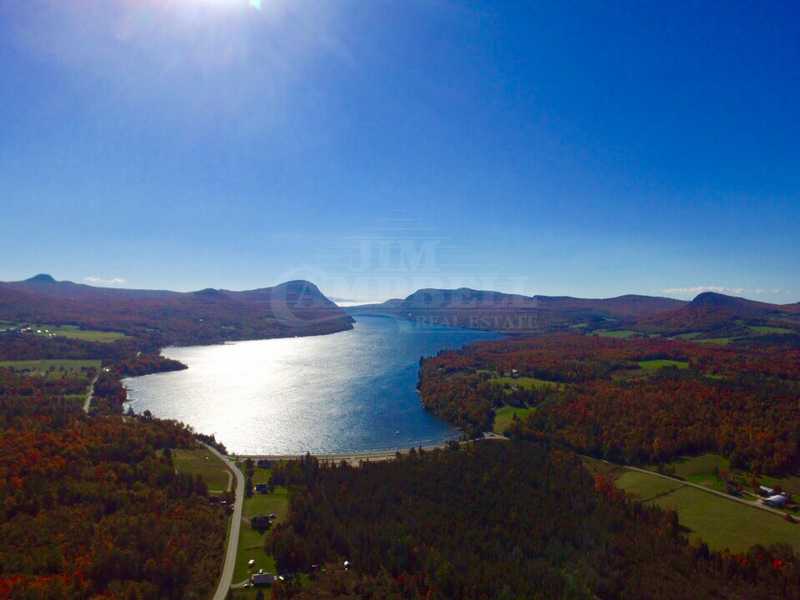 This is an absolute must see property on what many consider Vermont's most beautiful lake. On Lake Willoughby is where you will find this one-owner year-round home. Enjoy swimming and boating in the summer on a gorgeous body of water and snowmobiling and skiing at Burke Mountain in the winter. The house has open concept living, kitchen & dining room, a bedroom and full bath on the main floor with two additional bedrooms upstairs. The full walkout basement is framed for windows and ready to be finished off for additional living space. The frontage at this home is unique with large boulders. It is a great swimming hole and deep enough to bring your boat right up to the dock. The rock outcrops help protect your water crafts! Storage is contained in the over-size 2-car garage. The dwelling is serviced by a drilled well, concrete septic tank with a leach field, propane hot air heat and a propane hot water heater. Recent updates include a new metal roof and new sliders to the deck! Property is offered mostly furnished including the docks and dishes. Located along Lake Willoughby is where you'll find this charming farmhouse. For the last 50 years, it has been used as a 4-unit. Summer time rental rates are $750. per week for the two 2 bedroom units and $625. for the 1 bedroom unit, over $2,000. a week for summer time rental. Could be rented year round. Continue the same, create a family compound, or revert back to a spacious single-family home on the lake. Enjoy great sun exposure and beautiful sunsets as well as over 250 feet of nice sandy beach. Listed for quick sale BELOW town assessment! Worth a look! Lake Willoughby access without the higher taxes. Walk down the driveway to your lake access. 4 bedroom, 2 & 1/2 baths. Many upgrades and updates to this natural shake exterior colonial with beautiful vaulted ceiling in master bedroom & home office/bedroom. Gas fireplace in living/dining area. Very natural setting up above the main road with complete privacy. In spring watch the Rainbow Trout spawn in the cascading School House Brook falls or count the multitude of turkeys as they walk thru. Photograph from great viewing windows the deer or occasional moose & baby wandering down the driveway. Beautiful 3/4" Maple flooring, remodeled kitchen w/ceramic tile & 1st floor bath, newer roof. Midway between Newport and Burke. Can you imagine the kind of Lake Front Cottage that dreams are made of? Where summer is more than a season and occupies a permanent place in your heart. Where you hear the waves licking the shore, the birds singing from tree tops and branches low enough to climb. Where the sound that the crickets make seems loud. Where playing hide and seek is as easy as ducking behind a tree or laying low in among the forest ferns. Where you pretend the boulder your standing on is a mountain you just climbed. Where you are sure that none of the fish in the lake could ever love swimming as much as you do. Where everything cooked out on grill just tastes better. Where smores and fireside stories are a nightly routine and sunsets are absolutely breathtakingly vibrant. Make all of these dreams a reality with this 3 bedroom country cape, its beckoning waterfront and private woodland setting. There is a great storage garage for all the water toys and a front deck running the whole length of the cottage allowing for beautiful views of the water. There is also a large deck setting on rocks at the water's edge, a privilege that is grandfathered in. Add your own new pages in 562 Old 5A's memory book. Situated alongside Willoughby state forest with over 1600 acres of water and 7000 acres of Woodlands, this two bedroom, two bath, seasonal cottage offers a peaceful retreat coupled with all the recreation Vermont's Northeast Kingdom is famous for. Start your day with coffee on the deck and views of Lake Willoughby and the surrounding mountains- then, it's on down to the lake- this cottage and it's Association, share Lake access, offering 50' of waterfront to swim, kayak, scuba dive, sail or fish. Hiking trails dot the State forest and Westmore is an easy drive to Burke Mountain and nationally recognized Kingdom Trails. The present owners have a solid seasonal rental history.